Iraqi Prime Minister Haydar al-Abadi announced on Friday that Iraqi troops had captured the governmental complex in the center of Fallujah. The Lebanese newspaper al-Nahar (The Day) reports that the Iraqi army also took the eastern and southern districts of the city. Only some residential neighborhoods in northern Fallujah remain in the hands of Daesh (ISIS, ISIL). There, however, sources told al-Nahar that Daesh still rules with an iron fist, in the districts of Jolan, al-Muhandis, al-Wahda, al-Jumhuria and al-Andalus in the north. A source inside the city said Friday that it was nevertheless possible that the neighborhoods would fall to the Iraqi government within hours. The image of invincibility and the projection of power that Daesh has striven for during the past two years has been shattered, the Iraqi source in Fallujah said, at the hands of the various Iraqi forces. 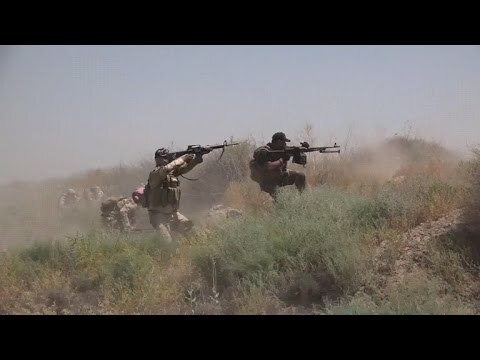 The Iraqi war information bureau said that a counter-terrorism unit liberated the district of Nizal entirely after imposing severe losses on the Daesh fighters. Meanwhile, the 17th Infantry Division, a Baghdad formation, continued to advance and it succeeded in liberating al-Ursan district entirely, and in securing the left bank of the Euphrates. It also announced that units of the national gendarmes liberated the governor’s mansion for the county of Fallujah in the center of the city and raised the Iraqi flag over it. Dozens of Daesh guerrillas were killed in the confrontations. The government forces advanced to Baghdad Street, expelling the enemy. Battles continue as the army seeks to fulfill all its objectives. Fighting continues as the counter-terrorism division seeks to take Fallujah Hospital. He called on all the institutions of the state to exert every effort to take care of the civilians and to deliver humanitarian aid, as well as to be careful of people’s property and homes. He said, “today is a day of forgiveness.” (He meant that although many Fallujans may have collaborated with Daesh because they saw it as savior of Sunnis, they should not now be punished, in the interests of bringing all Iraqis together under the banner of the central government. Having taken Tikrit, Ramadi, Hit and Fallujah, the Iraqi government has over the past 2 years decisively rolled bak Daesh. It is now virtually besieged in Mosul, which is landlocked and increasingly surrounded. As a governmental entity, I wouldn’t give Daesh more than a year. As a terrorist organization, it can be both long-lived and deadly.